El Yunque National Forest, formerly known as the Caribbean National Forest, is a forest located in northeastern Puerto Rico. It is the only tropical rain forest in the United States National Forest System. This forest is commonly known as El Yunque, which may be attributed to either a Spanish approximation of the aboriginal Taíno word yu-ke which means "white lands", or the word "anvil," which is yunque in Spanish. The second-tallest mountain within El Yunque is also named El Yunque. El Yunque National Rainforest is located on the slopes of the Sierra de Luquillo mountains, encompassing 28,000 acres (43.753 mi2 or 113.32 km2) of land, making it the largest block of public land in Puerto Rico. El Toro, the highest mountain peak in the forest rises 3,494 feet (1,065 m) above sea level. Ample rainfall (over 200 inches a year in some areas) creates a jungle-like setting — lush foliage, crags, waterfalls, and rivers are a prevalent sight. The forest has a number of trails from which the jungle-like territory's flora and fauna can be appreciated. El Yunque is also renowned for its unique Taíno petroglyphs. The forest region was initially set aside in 1876 by King Alfonso XII of Spain and represents one of the oldest reserves in the Western Hemisphere. It was established as the Luquillo Forest Reserve on 17 January 1903 by the General Land Office with 65,950 acres (266.9 km2), and became a National Forest in 1906. It was renamed Caribbean National Forest on 4 June 1935. It is home to over 200 species of trees and plants, 23 of which are found nowhere else. The critically endangered Puerto Rican amazon (Amazona vittata), with an estimated wild population of 30 individuals, occurred exclusively in this forest until 19 November 2006, when another wild population was released by the Department of Natural Resources in the municipality of Utuado's Río Abajo State Forest. Because Puerto Rico is south of the Tropic of Cancer, it has a tropical climate. There is no distinct wet or dry season in El Yunque; it rains year round. The temperature and length of daylight remain fairly constant throughout the year. The average temperature year-round is 80 degrees Fahrenheit (high) and 70 degrees Fahrenheit (low). All of these factors provide a year-round growing season. Its ecosystem is specifically surveyed by the Management Team of Ecosystems (Equipo de Manejos de Ecosistemas), which is led by Pedro Rios. Due to its location in the northeastern part of Puerto Rico, the incoming trade winds from the Atlantic Ocean bash into the mountains, leading to an excess of rainfall registered at about 240 inches (6.1 m) per year. This process is called orographic lift and accounts for the intense rainfall and constant cloud presence in this mountainous region. This constant cloud cover and persistent winds produced by the adiabatic process of air particles rushing up through the mountainside has affected the morphology of El Yunque, but the most effect has been on the bosque enano or dwarf forest. El Yunque is composed of four different forest vegetation areas: Tabonuco Forest, Palo Colorado Forest, Sierra Palm Forest, and Dwarf Forest. The following image shows the green wilderness of El Yunque from one of its peaks; Pico El Yunque. The Dwarf forest ecosystem is located at around 3,000 feet (910 m) and composes the smallest sub-region in El Yunque. The forest is characterized by the variation of vegetation that is only found in Puerto Rico. The vegetation shows stunted growth in which the diameter of the trunk is widened and the number of leaves on the branches is lower than expected. Other specific factors that affect the growth of this sub-region are the high level of acidity and poor water runoff from the soil. Although many species have adapted to these harsh environments, five species are frequent in the dwarf forest: Ocotea spathulata, Tabebuia rigida, Calyptranthes krugii, Eugenia borinquensis and Calycogonium squamulosum. The other abundant type of plants in the dwarf forest are epiphytes. El Yunque supports a vast array of animal and plant life that varies depending on the altitude range in the rainforest. The great amount of competition in the canopy does not allow lower level plants to develop and prosper. The characteristic of having a widened tree trunk is ideal for epiphytes that require a host to live. Therefore, a substantial amount of epiphytic plants have cemented their existence in the flora of El Yunque, specifically in the dwarf forest due to the moisture, precipitation and protection from the sun. Approximately 16 species of common coqui, members of the diverse neotropical frog genus Eleutherodactylus, are known in Puerto Rico. Of these 16, 13 have been found in El Yunque National Forest. This small frog earned its Puerto Rican common name due to the call of the most common coquí species in Puerto Rico, Eleutherodactylus coqui, which begins as the sun sets and ends in early dawn. This has made it an animal of great endearment to Puerto Ricans. Although the coquí is an amphibian, it possesses some features that are unusual in frogs. These differences are seen mainly in its morphology, reproduction, and developmental stages. In terms of morphology, the coquí does not have webbing between its toes because it is a tree dweller in moist environments. Another significant difference is that it does not have a definite larval stage and the eggs laid by the female are terrestrial instead of aquatic. This means that a miniature frog-let, rather than a tadpole, arises from the incubation period. The puertorrican parrot is a little parrot that measures 28–30 cm (11.0–11.8 in), the bird is a predominantly green parrot with a red forehead and white rings around the eyes. It's been extinct since extinct 1912. The species is the only remaining native parrot in Puerto Rico. The total estimated population was 58–80 individuals in the wild and over 300 individuals in captivity. Opened in 1996, the El Portal Rain Forest Center is designed to give visitors an introduction or beautiful beginning of what the rain forest looks like. A walkway set at 60 feet (18 m) above the ground allows for a view of the tops of trees, and another walkway winds along tree bases. Exhibits at the center focus on the plants and animals of the rain forest, the importance of rain forests around the world, and threats to rain forests and efforts to conserve them. There is a common misconception that El Yunque National Forest is the only rainforest in the United States National Forest System (NFS). However, this is not the case. There are other rainforests in the National Forest System, including those in Alaska (Example: Tongass National Forest) and the Pacific Northwest (Example: Mount Hood Wilderness) as stated in the US Forest Service website. As El Yunque's own official website states, El Yunque is the only tropical rainforest in the System, but it is not the only rainforest. There are two observation towers including Yokahu Tower and Mount Britton Tower. 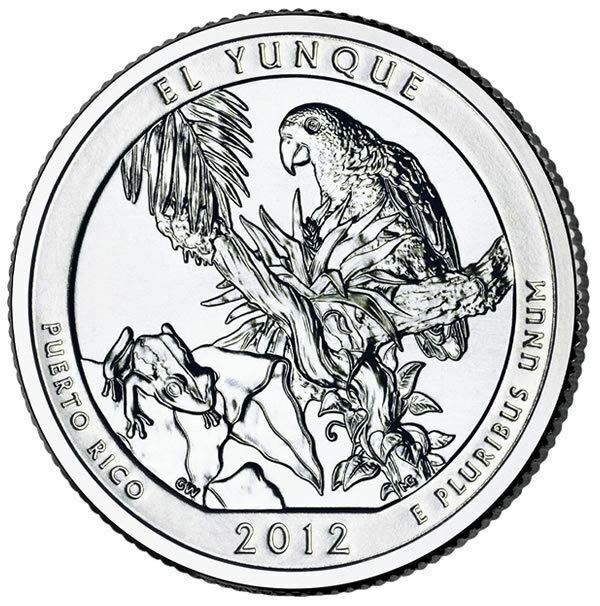 El Yunque National Forest was chosen to be Puerto Rico's entry in the America the Beautiful Quarters program. Its only National Park Service site, San Juan National Historic Site had already been featured on the District of Columbia and United States Territories Quarters in 2009. In 2002, the U.S. Congress designated areas bounded by the Río Mameyes, Río de la Mina, and Río Icacos in the Caribbean National Forest as components of the National Wild and Scenic Rivers System.